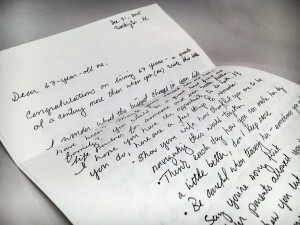 My colleague Jake gave me the idea to write the last letter to my future self – not like Matthew McConaughey style where I basically thank myself for being perfect, but a letter to perhaps remind myself of things that I may have lost sight of over time. 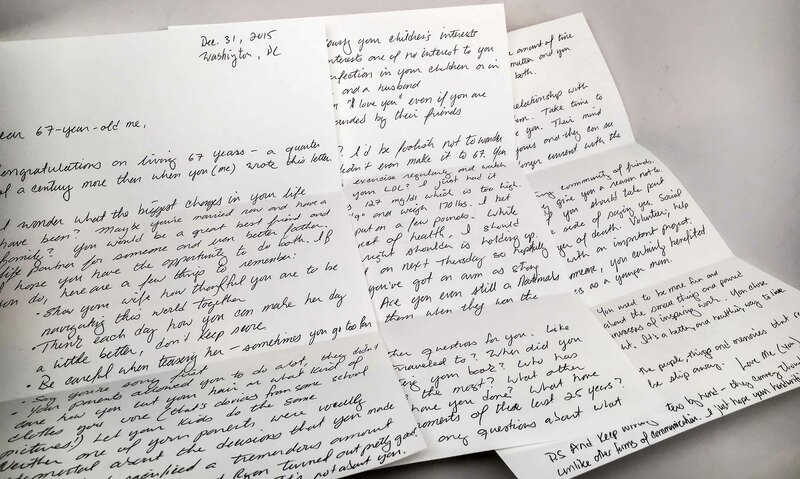 Today may be the last blog post of Year of Letters as the project comes to a close. I’ve written 365 letters, albeit not one every day like I hoped to. That proved to be a bigger challenge some days, but I kept mostly to it. I did fall seriously behind on the blogging aspect of the project, but I’d like to think that the absence of some posts were as a result of me spending real time with the people around me that I love rather than in front of my computer screen. People have asked me what I will do next year. I’ve decided to do a year of writing – but instead of writing so many letters (don’t worry, I’ll still be writing letters too), I’ll focus on finishing my book on the Year of Giving that I have more or less abandoned this year as a result of a lack of time. Happy New Year everyone! Thanks for the letters. Congratulations on living 67 years – a quarter of a century more than when you (me) wrote this letter. Your parents allowed you to do a lot, they didn’t care how you cut your hair or what kind of clothes you wore (that’s obvious by some school pictures) Let your kids do the same. Mom and Dad sacrificed a tremendous amount and as a result you and Ryan turned out pretty good. Accept that you too will do this. It’s not about you. Always tell them “I love you” even if you’re in public surrounded by their friends. How is your health? I’d be foolish not to wonder about that. Mom didn’t even make it to 67. You need to continue to exercise regularly and watch your diet. How is your LDL? I just had it checked and it was 127 mg/dl which is too high. Oh, and I’m currently 5’9” and weigh 170lbs. I bet you’ve shrunk and put on a few pounds. While we’re on the subject of health, I should ask how your right shoulder is holding up. I get it operated on next Thursday so hopefully it goes well and you’ve got an arm as strong as Stephen Strasburg. Are you even still a Nationals fan? Did you go see them when they won the World Series? I have so many other questions for you. Like where have you traveled to? When did you finally finish writing your book? Who has influenced your life the most? What other year-long projects have you done? What have been the happiest moments of these last 25 years? Notice I didn’t ask any questions about what TV shows you may have watched or the amount of time you spent at the office. It doesn’t matter and you should limit the time you spend on both. I hope that you have a good relationship with your children and you trust them. Take time to consider the advice they give you. Their mind is probably sharper than yours and they can see when your ideas are no longer current with the faster pace of society. Work hard to build a strong community of friends. Embrace people until they give you a reason not to. If you’re not sure if you should take part in something, err on the side of saying yes. Social isolation is the harbinger of death. Volunteer; help a neighbor or friend with an important project. Serve as a mentor to someone, you certainly benefited from the kindness of others as a younger man. Finally, lighten up a little. You used to be more fun and carefree. You worried less about the small things and poured your energy into large canvasses of inspiring work. You chose being happy over being right. It’s a better, and healthier, way to live. Laugh, love and hold tightly the people and things that really matter – let everything else slip away. P.S. And keep writing letters – they convey a meaning unlike other forms of communication. I just hope your handwriting has improved! This entry was posted in Just because and tagged advice, Day 365, final letter, future, handwritten letter, letter to future self, letter to self, Year of Letters. Bookmark the permalink.